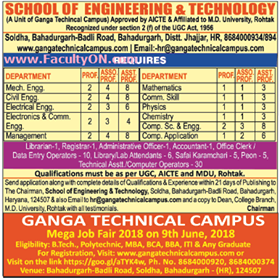 Ganga Technical Campus, Haryana has advertised in THE TIMES OF INDIA newspaper for the recruitment of Professor plus Associate Professor plus Assistant Professor jobs vacancies. Interested and eligible job aspirants are requested to apply with in 21 days. Check out further more details below. About College: GANGA TECHNICAL CAMPUS, We inculcate human value and professional’s ethics in our students enabling them in making decisions and creating new dimensions and societal interest. We strive to provide professional education in the field of engineering & technology,and management along with expose of latest and advanced techniques supplemented with tremendous performance of our country. We have carved out a distinct niche for Ganga Education hub in Delhi and NCR with four colleges and eight International schools covering all streams. Ganga technical campus is not a mere addition of a feather in Ganga Education hub’s crown, but a logical extension of our experience over 20 years of sheer hard work and meteoric growth.